The Duke of Kent lays a wreath in Glasnevin Cemetery, Dublin. The Duke of Kent (3rd left) is shown Eamon de Valera's grave in the Republican Plot in Glasnevin Cemetery, Dublin. A MEMBER of the royal family has laid a wreath at a memorial to rebels who fought and died in the 1916 Easter Rising. 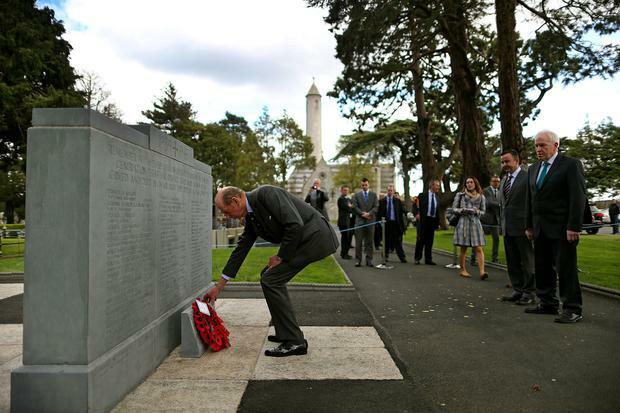 The Duke of Kent honoured volunteers at the Sigerson Memorial in Glasnevin cemetery, Dublin, where he also paid tribute to Irish soldiers who died in both world wars. The Duke is president of the Commonwealth War Graves Commission which over the last four years has worked with the Glasnevin Trust to erect headstones and mark 208 graves in the cemetery of Irish men and women who served in the British armed forces. A laurel wreath was laid in memory of the Irish rebels while a poppy wreath was laid at the commemorative walls to mark those who died in the First and Second World War. The visit saw the Duke become the first royal to paid tribute to Ireland's revolutionaries at the Glasnevin gravesides. John Green, Glasnevin Trust chairman, said the work done on remembering the Irish war dead was cementing relations with Britain. "The Commonwealth War Graves Commission, of which he is president, has been a wonderful partner without whom most of the 208 graves of people who fought in the First and Second World War would still be unmarked despite their great sacrifice," he said. "It has been a wonderful collaboration and we believe one that is playing it's part in further strengthening the bonds between our two great nations in this modern era." The Duke toured the site led by cemetery historian Shane Mac Thomais who highlighted some of the more significant plots including Daniel O'Connell's Crypt, the graves of Eamon de Valera, Michael Collins, Roger Casement and Charles Stewart Parnell and the Republican Plot. He also saw the graves of Sergeant Patrick Dunne and Volunteer Edward Ennis, two young men who died within months of each other in 1916, one fighting for Ireland and the other Britain. Sgt Dunne was wounded at the Somme and returned to Ireland where he died and Vol Ennis was found dead on railway lines at Connolly station. "The Duke was very impressed with the site and the nature of the historical importance and mindful of the amount of work that it would take to keep the place as well as we do," Mr Mac Thomais said. He was joined on his visit by Jimmy Deenihan, minister for the arts, heritage and the Gaeltacht, junior minister Brian Hayes, British Ambassador Dominick Chilcott, and Democratic Unionist MP Jeffrey Donaldson. The Duke suffered a mild stroke in mid-March and was treated at an undisclosed London hospital for a number of days but was back attending official engagements three weeks later.